C&T Q&A – Can You Have a Successful Handmade Business Without Etsy? 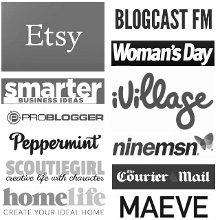 Do you think it’s possible to create a successful business without using Etsy? I used to sell jewelry on there and after 3 years my account was suspended for violating the etsy policies. I didn’t realize it and after pleading with the admins, I realized they weren’t going to let me come back. I’m on Big Cartel and sales are slow. I’m just not sure if realistically, it will ever amount to a successful business without Etsy. Any thoughts you have would be greatly appreciated. Thanks! First of all, I’m sorry to hear about your issues with Etsy, Kate, that must have been a rude shock. I’m glad to hear it hasn’t stopped you pursuing your business, though! Honestly, I’m the first to suggest that everyone who has a crafts-based business should have a shop on Etsy. I still make a good portion of sales there, and it’s where I find a lot of new customers. Etsy is definitely still the premier online marketplace for handmade – and not only that, it’s also a handmade search engine. I know that Etsy is my first port of call when I want to buy handmade. Both of these reasons are why I will never shut my Etsy shop – no matter how successful my own site becomes (Epheriell.com already accounts for well over half of my total online sales). However – as useful and awesome as Etsy is for growing and running your business – I also believe that anyone serious about their handmade business should set up their own shop on their own website. If you’re doing all the hard work to market your business and grow a customer base, you should be sending that traffic to your own website. Now – there are of course other marketplaces out there online, and if you make reproducible products (you are doing that, aren’t you??) you should set yourself up on as many of these as you can feasibly manage. If only with a small sample of your core range. I see these sites as marketing – getting my work out in front of as many people in as many places as possible, at low cost. Personally, I have my jewellery on Madeit and Blue Caravan here in Australia, as well as Supermarket HQ, Dawanda, and a few other places overseas. I make a nice number of sales across these marketplaces, but Etsy and Epheriell.com are my main shops, where I stock all of my work. If you can’t sell on Etsy, for whatever reason, you should seriously consider setting up your own site, rather then relying primarily on another venue. So, what are the costs vs benefits? Control, control, control – you can do exactly what you like, make it look how you like, and no-one can take it away from you! It’s your baby. Obviously, my recommendation is to have both – an Etsy shop and your own site (and any other venues you can manage). Having a shop on Etsy makes building your business a lot easier, especially in the beginning. You’ll find that you reach a kind of critical mass there, too – the more sales you’ve made, the more you’ll make as you are established as a serious seller. However, you can have a successful handmade business without Etsy. It will just take you a little longer to grow your customer base. But if you’re patient, work hard, market smart, and have a stellar website and webstore, you CAN do it. Want to take your Etsy shop to the next level, or set up shop on your own site for the first time? Join the email list to find out when I launch my upcoming ecourse, Set Up Shop.